The FEBASI. 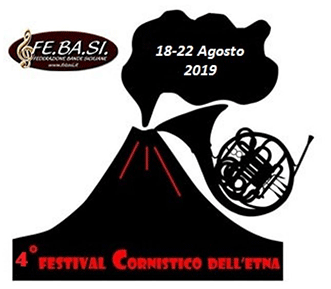 (Bands Federation Sicilian) after great success of lasts years is pleased to present the “IV EDITION of International Horn Festival of Volcano Etna" from 18 to 22 August 2019 The Festival born from the idea of stimulating young horn players to deepen the study of the horn with individual and group lessons of ensemble music. The Festival takes place from 18 to 22 August 2019 at the Centro Ricreativo Giovanile “San Filippo Neri” an approximately 1000m above sea level in the City of Zafferana Territory (district Cassone), a large facilities in a beautiful setting and in the Volcano Etna landscape in a pristine location in the midst of forests and volcanic land where the Sound of the Horn will be the protagonist. Each participant will be given the opportunity every day to do lessons with 4 teachers of national and international fame collaborating with major orchestras and institutions. Everything will be accompanied daily by the lessons of ensemble music for ensemble of horns by the Maestro Antonino Manuli, professional horn player and orchestral conductor. Will be five days of intense study, socialization and especially PLAY TOGETHER. On August 18, the inaugural concert will be held with solo concerts performed by the festival's teachers accompanied by the Symphonica Città di Viagrande Wind Orchestra, on August 19 the "First Horn Competition of the Horn Festival of Etna" will take place (at the bottom you will find the announcement and all the info and request for participation). In the evening the Sicilian Horn Ensemble will perform at Zafferana Etnea, on August 20th there will be a concert of the winners of the competition and on August 21 the concert with the Big Ensemble of Horns directed by M ° Manuli. On August 22nd the lessons will end at 2.00 pm to leave the structure free. The group will dissolve immediately after lunch set for 2.30pm.